A fast-growing population of 780 million people around the world lacks access to clean water. Water scarcity proves one of the greatest challenges of the United Nations-led Sustainable Development Goals (SDGs) and is thus a priority for the Copper Alliance® and its members. Mining is water intensive, particularly during the separation and transportation of ore and tailings. Anglo American, as one of the world’s largest miners, is uniquely poised to scale its conservation within the framework’s 2030 target. The Atacama Desert region surrounding the Los Bronces copper mine in Chile is notoriously dry and located at one of the planet’s highest altitudes. 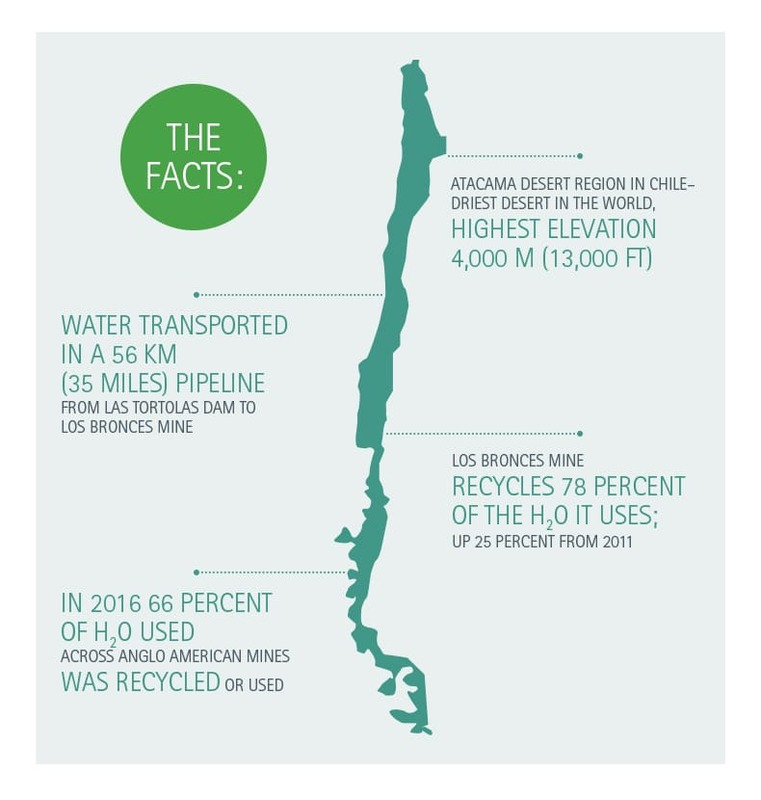 With its declining ore grades and proximity to Santiago’s growing population of 6.3 million, the mine was drawing heavily on the local water supply. To reduce this environmental impact, Anglo officials developed a novel approach to recycle vast amounts of water. After months of planning, Anglo upgraded its water transportation system, which moves water along a 56-kilometre (35 mile) pipeline from the Las Tortolas tailings dam, using an integrated automated circuit for recirculation. Central to this advancement is the “Pervasive Sensing” technology Anglo developed with partner Silixa following FutureSmart Mining™’s 2015 Open Forum on water. Pervasive sensing, which is the capability to deploy large numbers of sensors, link them to communication networks and analyze the collective data, is transforming many industries. In mining, networked sensors are used for remote operation, automation, health and safety, and exploration. In this application, the sensor is a fiber-optic circuit measuring mine water flows in real time and maximizing conservation at multiple points, with the ability to monitor a region equal in size to Lower Manhattan. The cable—running without expensive parts or power—is more cost efficient and environmentally sound than the traditional devices to gage water-stressed areas at predetermined points, supporting better process control, water conservation and, ultimately, improved metal recovery. Now, Los Bronces recycles more than 78 percent of the water it uses, a major increase from the 25 percent it was recycling in 2011. In 2016, 66 percent of the water used across Anglo American’s mines was recycled or re-used. Anglo’s next goal is to increase the amount of recycled water across its operations worldwide by 50 percent before 2030. Last year, this technology was honored at Mines and Money in London with an Outstanding Achievement Award for the Best Use of Smart Technology for Sustainability. With approximately three-quarters of its assets in water-stressed areas, Anglo’s freshwater consumption reduction target presents a unique opportunity to grow the SDG framework at scale. The Copper Alliance® is a network of regional copper centers and their industry-leading members. It is responsible for guiding policy and strategy and for funding international initiatives and promotional activities. Headquartered in Washington, D.C., the organization has offices in four primary regions: Europe and Africa, Asia, Latin America and North America. Copper Alliance® programs and initiatives are executed in more than 60 countries through its regional offices and country-level copper promotion centers. Anglo American plc is a diversified multinational mining firm based in Johannesburg, South Africa and London, United Kingdom, and is a major copper producer with four red metal mines in Chile. Enabled by robust, cross-operational and stakeholder consultations, Anglo’s methodology is embedded in its FutureSmart Mining™ initiative, which applies cutting-edge technology and broad innovative thinking. This encompasses collaboration to ensure safer, more efficient and more sustainable mining while accommodating the needs of each host community.